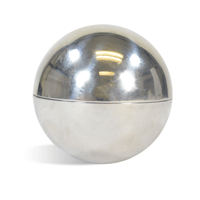 This Stainless Steel Bath Bomb Mold makes making Bath Bombs super easy! Each set creates a 2 inch bath bomb. Bath bombs created are approximately 3.2 ounces. 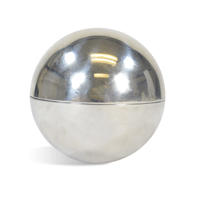 Bath Bombs have never been easier to make than with these Stainless Steel Ball Molds! Each set of 2 creates 1 2.5 inch bath bomb. Makes an approximately 6 ounce bath bomb. 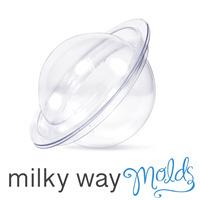 Our 2 piece Bath Bomb Mold is perfect for shaping the perfect handmade 2.75" bath bombs. For those that sell retail, simply apply a shrink band and you are ready sell your product in this revolutionary package. Average weight of each bath bomb: 7.5 oz. We recommend shrink band 135 x 55. This is applied around the top and bottom of the mold, not around the middle or widest part. 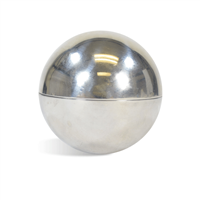 The large soap balls made from this soap mold can be used as a bar on their own or embedded into a loaf. Create creepy eyeball soap for Halloween, Holiday soap ornaments in December or fishing bobber soap for Father’s Day. 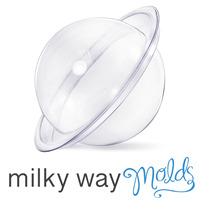 Bar Cavities: 8 Bar Depth: 2.25"
Bar Length: 2.25" Bar Width: 2.25"
Create small soap balls with this silicone soap mold. Embed these cute soaps into a loaf or larger bar mold for a creative and unique soap design. These small soaps can also be used as single use bars for the gym! Bar Cavities: 27 Bar Depth: 0.8"
Bar Length: 0.8" Bar Width: 0.8"